I mentioned yesterday that you can set up a quasi-credit monitoring service for yourself (at least one that gives you an update every four months) by using AnnualCreditReport.com. I also mentioned that the Credit Bureaus, agitated at being forced to provide free reports to mere consumers, try to take one last pot shot at you in an attempt to get your hard earned dollars. 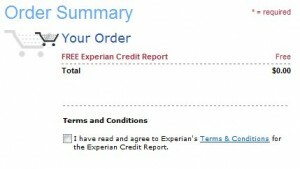 The first image to the left is what you will see on Experian’s site after you fill out your information on AnnualCreditReport.com. This is the landing page, and you are on step one of three (seen at the top). There are two offers on this page. 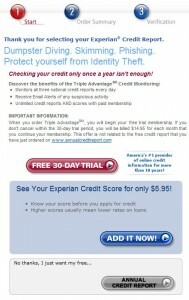 The first is to sign you up for their credit monitoring service at a whopping $14.95 per month after the first 30 days. That’s $179.40 per year. Garbage. The second offer is directly below the first. Maybe they are thinking the consumer will think there is only one offer and this is the “gotcha” part. I don’t know. 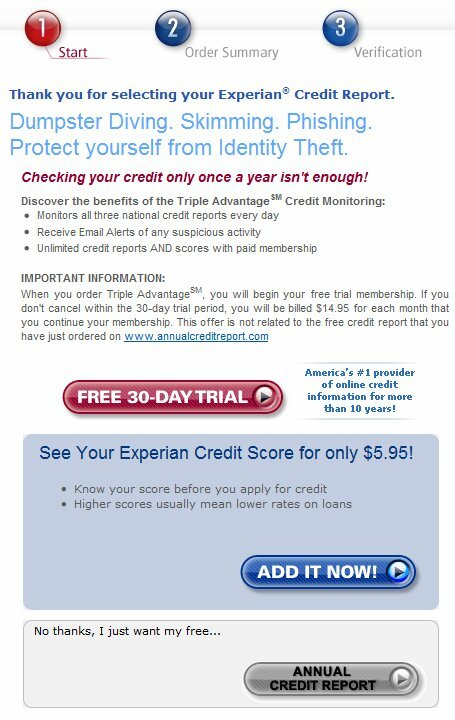 It’s in the blue box (with vibrant white text) and the offer is to give you your Experian Credit Score for “only” $5.95″!”. As I said yesterday this is an internal-to-Experian (or whichever credit bureau you are using) score that is meaningless in the real world with lenders. You need your Fico score for the real world. Only at the bottom will you notice the gray bar (with hard to read black text) that sends you off to get your free annual report without a credit score attached to it. This is the link you want. The second image here to the right is what you should see after you click the gray Annual Credit Report button at the bottom of the first page. It’s your order summary. See how there is no cost associated with this? That’s what you want. If you see any cost associated with your order at all you must have mis-clicked. Go back and get the free report. Of course you also have to agree to their terms and conditions. The pages after this show you your actual report where you review your open accounts, etc.